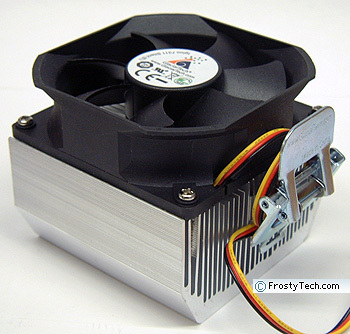 Abstract: In this review Frostytech will be examining the Glacialtech Igloo 7311 Silent AMD Athlon 64 heatsink. As AMD releases its energy efficient processors with power loads in the range of 65W and 35W, simple extruded aluminum heatsinks are once again becoming common. Ultra low power "environmentally friendly" processors emit significantly less heat, and consequently less extensive thermal solutions can often do the job. The real crux of the deal is the very low cost of an extruded aluminum heatsink compared to a complicated copper cooler. 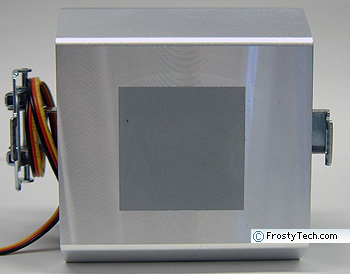 Testing low power heatsinks is a bit challenging right now because Frostytech's K8 test gear is configured to a 125W synthetic heat load. Given the new class of low power AMD's Athlon64 and Sempron processors, you'll have to look at our synthetic thermal tests as a worst case scenario stress test. Glacialtech are Taiwanese thermal solutions manufacturer, and while the company has typically focused on OEM work until recently, it is now aiming to make its name known. 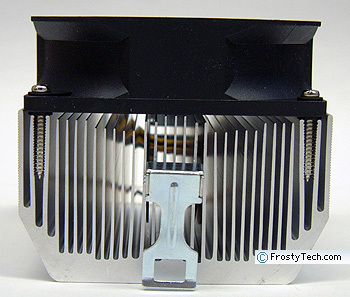 That's all well and good, but at Frostytech we look at such things one heatsink at a time. If Glacialtech has the thermal engineering to back up its products, that's all we need to know. Like the Glacialtech Igloo 7222 Light, the Igloo 7311 Silent heatsink is suitable for 65W and 35W energy efficient Socket AM2 AMD processors, or older socket 754/939/940 CPUs. 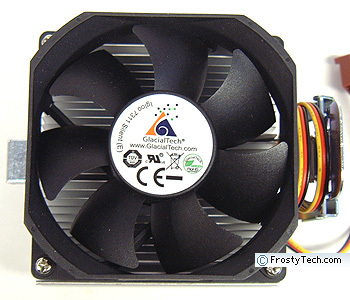 Its 25x80x80mm fan operates at a fixed speed of 2000RPM, and is not PWM compliant. The Igloo 7311 Silent has a nice tool free clip mechanism, making a reassuring positive "clip" as it locks down on the central lug of the AMD heatsink retention frame (either 939 or AM2 variety). The unit ships with a pre-applied patch of high viscosity thermal compound on its base. The 25x80x80mm fan spins at 2000RPM, drawing power from a standard 3-pin motherboard fan header. 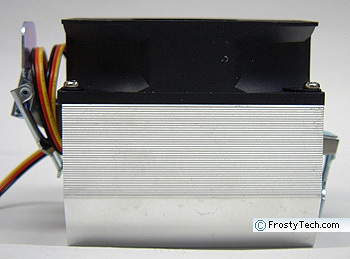 The fan supports RPM monitoring but not PWM speed control. The seven-bladed impeller is not protected by a fan grill, but as rotational speeds are low this isn't a major concern. With the fan removed from the body of the Glacialtech Igloo 7311 Silent heatsink we can see its basic extruded construction. Each aluminum fin is ~0.75mm thick, and spaced ~1.5mm apart. 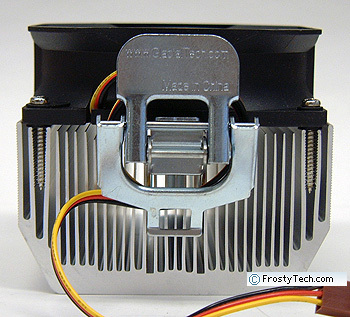 The steel clip fits in between two spaces, so it does not prevent air from flowing smoothly through the body of the heatsink (as a large central clip body might). Standing 70mm high, the Glacialtech Igloo 7311 Silent uses a tool-free clipping system. The clip locks onto the central retention lug so both AM2 and 939 motherboards are compatible. The outside of the extruded aluminum body is scalloped, this improves grip and surface area to some extent. Inner fins are smooth. The base measures 6mm thick, fins are on average 35mm tall. Note the tool free clip. In one operation it clips onto and toggles down to apply clamping force to the processor. We really like the simple and assuringly "engaged" feel this clip has when engaged. 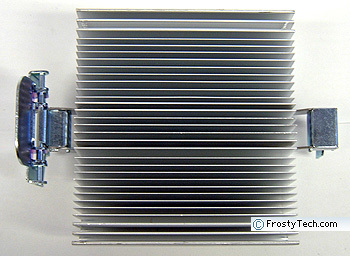 The 80mm fan screws directly into the aluminum heatsink, a common attachment method for inexpensive thermal solutions. The plenum is around 4mm between the tips of the fins and the base of the fan. The base of the Igloo 7311 Silent heatsink is machined with a obvious ridge over the entire surface. A patch of grey thermal compound is applied by the manufacturer, and this works in conjunction with the rough base surface finish. The base measures 77x60mm in size. Surface roughness is equivalent to ~125 microinches, which is satisfactory for this application.